The company behind the Nextalk network is RFG Communication, whose Managing Director, Wayne Martin joined the company in 1992 as Workshop Manager and went on to buy the company in 1995. Since then the business has grown and broadened its customer base from serving the farming community to include a wider service industry profile from its state of the art facility in the Gants industrial area in Strand, Western Cape. RFG Communication is the majority shareholder in Nextalk, a wide area, trunked digital radio network offering seamless roaming of connected equipment between its strategically located repeater sites. The building of the network started in 2009 to meet demand from customers wanting wider coverage along with the features and flexibility of digital technology without having to apply for new licenses or invest in their own infrastructure. At the time, it was a forerunner in harnessing digital radio communication in South Africa and the first system in the southern hemisphere to employ Kenwood NEXEDGE multisite equipment and infrastructure. Today, Nextalk is a 12-site PAMR network with a licensed 8GHZ IP backbone and redundancy built into both the network infrastructure and its IP backbone to assure 99% system availability. It is the most advanced radio network currently operating in the Western Cape, providing coverage from Cape Town to as far as Vredenberg, Robertson and Caledon; and one of the few networks able to serve Sea Point, Camps Bay and Hout Bay. Kenwood NEXEDGE with its 6.25kHz FDMA narrowband protocol was chosen as the basis for the Nextalk system for a number of reasons, as Wayne Martin recalls: “Building a new, wide area digital PAMR system from scratch requires investment and taking a long-term commercial view, so we reviewed our options carefully before deciding on Nexedge on the basis of its reputation, performance, infrastructure cost, flexibility, features, ease of implementation and the excellent technical support from both Global Communications and the team at JVCKENWOOD in the UK”. 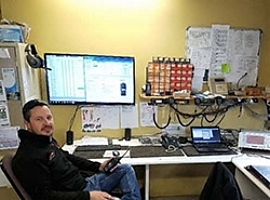 Designed for both redundancy and resilience, the Nextalk network is supported 24/7 by Technical Manager, Kevin Martin and his team, while each site additionally features battery backup and generator points with automatic transfer switches and IP network redundancy. The fully digital NXDN Type C trunking system currently offers 30 channels on an L3 network with ring topology and employs OSPF (Open Shortest Path First) routing protocol. Each of the 12, Microwave IP interconnected sites feature masts of between 6 and 30 meters in height with Webb HD 400 UHF folded dipole antennas. They are equipped with an average of 4 Nexedge NXR-800 repeaters and in terms of the equipment used by subscribers, the system supports 250 Nexedge NX-800 mobiles and 350 NX-320E2 hand-portables. Wayne Martin concludes: “The beauty of building a network from a clean sheet is that you can plan for the future. That’s why we made sure that we used equipment and infrastructure that not only meets current requirements but can be easily upgraded. We are already planning to add 3 sites to extend coverage and upgrade the entire network to NEXEDGE Generation 2 and the KAS-20 GPS AVL / Dispatcher software suite which will significantly increase subscriber capacity and offer customers more data features”. The park which is situated in the heart of the Lowveld covers an area of 19,485 square kilometres and became South Africa’s first national park in 1926. Kruger National Park borders with Zimbabwe in the north and Mozambique to the east and is part of the Kruger to Canyons Biosphere, an area designated by the United Nations Educational, Scientific and Cultural Organisation (UNESCO) as an International Man and Biosphere Reserve. It is the natural habitat to some of the most diverse and important wildlife on the planet. The South African National Defence Force plays a dual role at the park in protecting its national borders and supporting the SAN Parks game rangers in their vital operations against rhino poachers crossing into the park from Mozambique. The Kenwood NEXEDGE® system employed by the SANDF at Kruger National Park is based on the International Telecommunications Union (ITU) accepted NXDN, 6.25 kHz channel-spacing FDMA narrowband digital land mobile standard. Global Communications enjoys a long and productive relationship with SANDF’s SA Army Signal Formation which has been using Kenwood equipment since 1988/89. The Signal Corps emblem depicts Mercurius, the messenger of the gods who projects their motto “Certa Cito” meaning “Swift and Sure”. He recalls while recovering in hospital, that he knew a key part of his rehabilitation would be to refocus his life not just to make sense of his disability but more important, to challenge his abilities. It was here that with the support of family and friends, his dream of competing at Le Mans as only the second disabled driver to take part in a major FIA endurance race began to take shape; a dream he dubbed his ‘race for life’. Fred has always had a passion for motor racing and wanted his entry into the sport to be at a high level, where he would push not only his limits but those of engineering and technology. JVCKENWOOD and its mission-critical P25 specialist, EF Johnson Technologies, have won a contract to deliver a P25 system solution – including radios and support services – to the Taipei City Police Department. This marks the first time that JVCKENWOOD and its affiliate EF Johnson have teamed up to secure a major contract. Taipei has a population of 2.7 million; Taipei City PD operates 14 precincts and 94 police stations over an area of 270 square kilometers. For its scale alone this represents a considerable challenge in terms of radio communications. The solution is a cutting-edge P25 system that will improve coverage and provide secure, reliable city-wide communications. P25 is a suite of standards developed to ensure interoperability among public safety agencies – including law enforcement, fire departments and EMS. The feature-packed NX-5000 Series and the ATLAS solution are designed to answer the demanding requirements of today’s mission-critical users, and offer KENWOOD’s renowned quality and first-class reliability, even when used in demanding environments. By investing in P25 technology, Taipei City PD has a future-proof system. They will benefit from greater choice and enjoy all the benefits of a solution that meets the complex needs of law enforcement in Taipei. KENWOOD, a brand of JVCKENWOOD Corp., is renowned for high sound quality and technical expertise in the fields of car electronics, radio communication systems and audio equipment. EF Johnson Technologies Inc. was acquired by JVCKENWOOD in 2014 to enhance its P25 product offering with an extensive range of solutions and options for professionals in the public safety market. • NEXEDGE is a registered trademark of JVCKENWOOD Corporation • ATLAS and StarGate are registered trademarks of EF Johnson Technologies Inc. • All other company names, brand names and product names are registered trademarks or trade names of their respective holders. Based in North West London, the 78 Wembley Squadron, RAF Air Cadets, is part of the Royal Air Force and forms a yout organisation for young people aged 13-20. It offers cadets a range of different activities which will help develop young adults by building their self- confidence and helping them to gain key skills which will be essential in their adult lives. There are numerous diverse activities which cadets participate in including flying, gliding and navigation programmes, involvement in the Duke of Edinburgh, Adventure training, Rafwarma and Nijmegen. As a squadron they are actively involved in the local community and volunteer at several events such as the NFL games at Wembley and helping in the careful removal of the field of 888,246 ceramic Remembrance poppies installation from the Tower of London’s moat. 78 Wembley Squadron have previously used a number of different radio systems, some of which did not meet all of their needs. However, the Kenwood TK3501 ProTalk license-free PMR hand portable walkie talkies and EMC-11 clip microphones with earphones have exceeded their expectations. The radios, have proved themselves at events which the Squadron attends and during the twice-weekly cadet’s nights where they provide clear communication at opposite ends of a large building and throughout buildings within the base. This has allowed lessons to run on schedule and given NCOs the ability to issue alerts should there be any change of plan or factors which could affect the safety of cadets. The radios also play a central part in the Squadron’s initiative exercises where cadets are blindfolded and only allowed to receive radio communication to help them navigate from one side of the squadron base to the other. During flying and gliding activities, the radios are used by NCOs (Non-Commissioned Officers) to marshal cadets to the correct aircraft safely and efficiently while at the many sporting events which take place at various locations within the base and other locations, staff and NCOs can let each other know the outcome the activity, ensure cadets are directed to the right areas and even provide live commentary on events as they take place to other members of the squadron. At a recent Duke of Edinburgh expedition, cadets were sent deep into woods and forest where there was no mobile phone reception, so the radios proved to be invaluable in allowing assessors to be kept updated with location information to ensure the safety of the group and in helping cadets to build their teamwork and communication skills. Representing the new generation of trunk radio operators, management at CitiCall has over three decades of radio/telecom expertise. Today, CitiCall is a nationwide digital trunk radio operator employing NEXEDGE® technology. For the SEA Games, CitiCall worked in partnership with Radioquip Communications, a dealer with 17 years of experience managing radio rentals for such sporting events as international motor racing, marathons, golfing, tennis, football, rugby and swimming competitions. The Southeast Asian Games – SEA Games – started in 1959. This sporting event is held in one of the 11 participating countries bi-annually (between the years when Olympic Games and the Asian Games are held). And in 2015 it was Singapore’s turn to be the host. The 28th SEA Games were held over 12 days, June 5-16. A total of 7,000 athletes and officials from the 11 countries participated in 36 sports and 402 events. 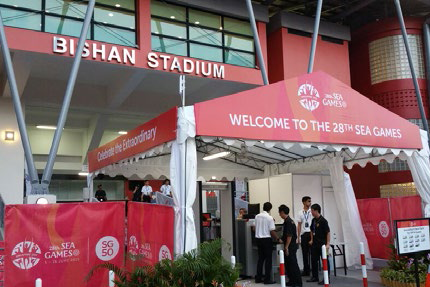 The Singapore SEA Games Organising Committee was in charge of the 28th SEA Games, and it was clear from the start that reliable communications would be critical to its success. Apart from the scale of the games, there was the sheer complexity. The main venue was the National Stadium, but there were also 31 other stadiums and sporting facilities around the country. Additionally, there was no central village to accommodate everyone; instead, no fewer than 7,000 athletes and supporting staff were accommodated at 20 different hotels throughout Singapore. Providing communications for the officials and 17,000 volunteers at all these locations, as well as at the air and land borders was never going to be easy. For this reason, the contract for supplying communications for the games was put out to public tender. The Singapore SEA Games Organising Committee attracted bids from CitiCall and another trunk radio operator, and CitiCall was chosen. As well as demonstrating extensive knowledge and experience, CitiCall was able to offer a strong support team. It had evaluated several infrastructure technologies based on technical performance and commercial feasibility, deciding to deploy a NEXEDGE digital trunking system which, with its robust infrastructure, is considered to be a true trunking radio system. Moreover, this flexible system operates in Trunking, Conventional Repeater, and DMO (Direct Mode Operation) modes. 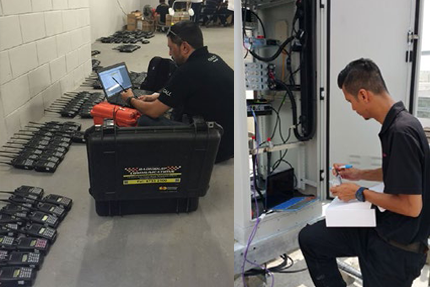 Additionally, NEXEDGE trunk radio base stations feature fail-safe and fail-soft operation, deemed to be crucial for the SEA Games opening ceremony. With NEXEDGE CitiCall has rapidly built up a reputation for providing reliable radio services at major events in Singapore, and this in turn helped the company to clinch the SEA Games contract. CitiCall went straight to work as there was no room for trial and error. It took three months to complete installation of the base station infrastructure using high-quality RF components, antenna systems and combiners. This provided building coverage at Singapore’s National stadium and at Changi International Airport. The stadium was a huge challenge, but CitiCall made good use of the excellent propagation characteristics of NEXEDGE’s narrowband 6.25 kHz FDMA technology to deliver the radio coverage required. In addition to Radioquip, CitiCall was also supported by JVCKENWOOD*3, the manufacturer of the KENWOOD brand radio equipment, which provided consultation and advice, helping to find solutions to any problems and troubleshooting the RF interference encountered at certain sites. Also the JVCKENWOOD factory ensured that both repeaters and radios were delivered in good time for programming and deployment. At large events like the SEA Games, CitiCall makes sure that the organizers enjoy secure voice communications, independent of any mobile phone networks. When a stadium is occupied with 50,000 phone-carrying spectators, only radios can ensure that all calls get through. CitiCall is also confident that the organizers can also rely on the priority broadcast feature of NEXEDGE radios. The SEA Games communications system had to cover 31 event sites, 20 hotels and the National Stadium. Network coverage was also required for the airport and land immigration checkpoints for the VIPs and athletes arriving from the 10 other countries. A total of 4,600 radios, including the NX-320M6, NX-320M4, NX-340M2 and NX-820-E.The portable radios were used for transportation, hospitality, event management, security, competition management, anti-doping, etc. The NX-820 radios were installed at command centers and 30 officialcars were equipped with NX-320radios for the SEA Games cycling event. This took a road-raceformat and included a 5km segment through the Marina Coastal Expressway tunnel. The organizers were able to maintain radio contact inside this tunnel thanks to the mobile radios in the official race vehicles traveling with the pack. Following the success of the 28th SEA Games, CitiCall sponsored radio communications for the 8th ASEAN Para Games held Dec. 3-9, 2015 with participation of 3,000 athletes and officials from 10 countries. This was the first and biggest South East Asian multi-sports event for persons with disabilities Singapore had hosted. Many tales of inspiration were written after a week of competition celebrating the achievements and potential of people with disabilities. 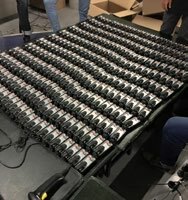 A total of 1,100 NEXEDGE radios were used for the opening and closing ceremonies and at the competition venues inside the billion-dollar Singapore Sports Hub. JVCKENWOOD Corporation was presented with a letter of appreciation for many years of service related to the amateur radio system on the International Space Station as well as support of future operations, in Tokyo on August 22, 2015. ARISS (Amateur Radio on the International Space Station), the organization in charge of the amateur radio station system on the ISS, commended JVCKENWOOD for contributing the radio system and providing technical support during the ARISS International delegates meeting held in Tokyo this year. Sponsored by amateur radio organizations and space agencies in the USA, Russia, Canada, Japan and Europe, the activities of ARISS are designed to inspire students worldwide, to pursue interests and careers in science, technology, engineering and math through amateur radio communications opportunities with the ISS on-orbit crew. The amateur radio system that JVCKENWOOD provided has been running for over 10 years since its installation on the International Space Station in 2003, where it has reliably assisted communication between astronauts on the ISS and amateur radio operators on earth, possibly including a whole new generation of astronauts and scientists. This system is based on the TM-D700E radio, modified to support ARISS operations. Europe’s Largest NEXEDGE® Digital Trunking System. The completion of the fifth phase of deploying Kenwood NEXEDGE® digital trunking infrastructure sees Dekbera’s RadioNET communications network firmly established as Europe’s largest NEXEDGE® trunking system. Situated across the Vistula River from the meticulously rebuilt and beautiful Old Town in Warsaw is the stunning Stadion Narodowy, the national stadium for Poland: the most popular place in the country, the biggest multifunctional arena. The Stadium was designed by the German-Polish consortium of Gerkan, Marg and Partners, J.S.K Architekci Sp.z.o.o. and Schlaich Bergermann und Partner and constructed by the German-Austrian-Polish consortium led by Alpine Bau and comprising Alpine Bau Deutschland, Alpine Construction Poland, PBG SA and Hydrobudowa Poland SA. It has a total volume (without roof) of more than 1,000,000m3 and a total area of 204,000m² which with its seating capacity of 58,145 makes it the largest sport, music, entertainment and culture arena in Poland. The Stadium was completed on 19th January 2012 to perform its duties as a principal venue for the UEFA EURO 2012 and will host the 2014–15 UEFA Europa League final. One of the most outstanding features of the stadium is its translucent retractable roof housed in a ‘nest’ suspended 100m above the centre of the pitch. Made from a Teflon coated fiberglass membrane resistant to rain and heat, it can withstand a loading of up to 18 cm of wet snow. The total weight of the steel-cables supporting the roof structure is 1,200 tons and the ‘nest’ features four LED display screens, each with an area over 50m². Expocom SA were briefed to design a new system that could meet the current and future site communications needs at La Sagrada Familia and working with JVCKENWOOD Ibérica, created a system based on Kenwood’s award winning NEXEDGE® digital technology. The new NEXEDGE® digital system is designed to provide full coverage of the site, from the highest point in the construction of the remaining towers to the depths of the crypt and everything in between including offices, museum and public spaces. It is configured as a 4-channel trunked repeater network with a fixed base radio serving thirteen user groups linked via Kenwood’s KAS-10 system management software to a command centre run by the Basilica’s security team. Following extensive testing, it was found that two antennas, one for reception and the other for transmission located within the building would give full coverage to all areas and over a period of time the system was installed and rolled-out by the Expocom team across the user groups including management, security, facilities management, information center, guides and hosts and the large construction team. The 4-channel trunked repeater system serves over 140 NEXEDGE® hand-portable radios, 20 are NX-320E models with full keypad and display to send and receive text messages, alerts and alarms while the remaining 120 NX-320E2 radios feature displays and simplified keypads. With construction scheduled to continue for at least another 15 years, Expocom ensured the new system was designed both with redundancy to cope with peaks in traffic during major events or an incident and to be fully scalable to facilitate the expansion of channels, users and groups into the future. While not the largest of NEXEDGE® systems, La Sagrada Familia is certainly one of the most important and prestigious and it was a privilege to have worked with the team at the Basilica and Expocom S.A. to deliver enhanced safety and security with increased coverage for the benefits of the millions of visitors each year. 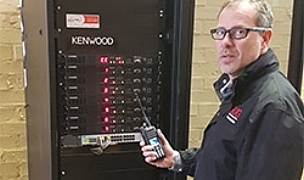 One of the most comprehensive Kenwood NEXEDGE® digital radio systems has been completed by Brabourne Communications for Rio Tinto Alcan. Nestled at the foot of Ben Nevis in the Scottish Highlands is the last remaining aluminium smelter in the United Kingdom. The Rio Tinto Alcan [RTA] plant in Lochaber contributes over £8 million a year to the Highlands economy and employs 180 people, making it one of the region’s largest private sector employers. I have been interested in Ham Radio since 1954 and currently hold the UK call g3rcq which I have had for 51 years. Over this lengthy time I have seen many changes and advancements in our hobby of Amateur Radio, there was a time when many did not think SSB would replace AM – or Transistors replace valves. Kenwood and its local distributor Sectron have recently delivered a nationwide NEXEDGE digital two-way radio system for the National Police Service in Bulgaria. James Atkinson of Wireless Magazine reports from his visit to Sofia. Delivering security and public safety at one of the world’s largest Cathedrals.